here are nearly 200 different American Fork Utah Homes for Sale. Most of these properties are residential, single family homes, but there is also a large number of condos and townhomes in American Fork. Prices of American Fork Real Estate have gone down over the last four years. In 2013 houses that sold had a median sold price of $193,500. In the 3rd quarter of 2013 the average single family homes on the markets was nearly $200,336. The average price of homes for sale in American fork, Utah is just over $188,214. Other real estate on the market in American Fork includes 27 condos, 8 multi-unit buildings including duplexes, triplex, and fourplexes and other multi-family properties for sale. The best way to find homes in American Fork is to request Team Teasdale's assistance. They will help you watch for a bargain. If you are looking for Realtors that list and sell homes in American Fork area contact Team Teasdale Realty. The MLS listings do not include for sale by owner listings. If you need help selling a home in American Fork let our team give you a free comparative market analysis (CMA). Search American Fork Homes Today! There are new and old homes alike in American Fork. Many of the major neighborhoods and developments have names like Northgate, Columbia Village, Skyline Heights, Plum Tree Lane, Chipman Village, Riverbend, Mit-Del Estates, Pebblewood, Afton Meadows, Chadwick, Joilet, Shalimar Acres, Valley View, Legrand Mott, Mt. Timpanogas Villas, Virginia Ridge, Legacy Estates, Liberty Cove, Spring Hollow, Hillcrest Acres, Heirloom Cottages, Makin Estates, Kimberly Estate, Valley East, Liberty Cove, Hilltop Estates, Nob Hill, Brigham Place, Virginia Ridge, Orchard Hills, Aurora Estates, Sparks Place, Spring Hollow, Chipman Farms, Mountain Meadows, Stone Hollow, Loafer Acres, Lesley Lane, Garden Spire, Briarwood, Benchwood, Mulberry LN, Sunrise, Searle, Temple Meadows, Autumn Crest, Durrant Meadows, Risenmary Ridge, Jockey Hollow, Chamberry Fields, Indian Sky, Temple Haven, Hill Valley, Southam Acres, Royal Estates, and Anderson Acres. American Fork has a good selection of condo and Townhouse Communities. 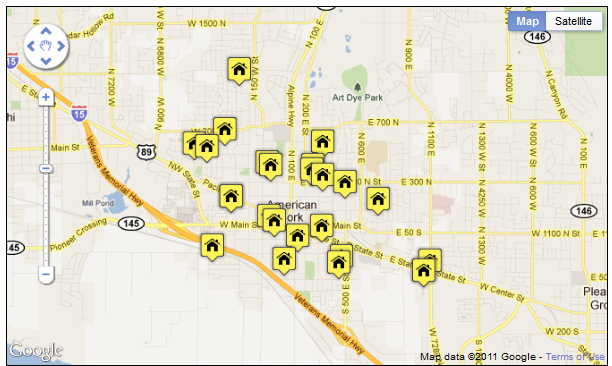 Currently there are more than 20 active American Fork Condo listings on the Multiple Listing Service (MLS). Some of the larger Condo and Townhome Communities include: Century Village, Colonial Pines, Crystal Cove PUD, Penny Lane, Maple Crest, Haymaker, Pebblewood, Timpanogas Heights, and Mount Timpanogas Village. Some of the older condominiums in complexes like Colonial Pines and La Marida start at less than $100,000. Some of these condo complexes are simply old fourplex style apartment units that have individual ownership. The more expensive condominiums in 55+ retirement communities like Crystal Cove can be more than $300,000. It is definitely a buyers market in American Fork. In the 3rd quarter of 2012, only 68 residential properties listed on the MLS were sold. The average MLS listing has been on the market for a hundred days. Home prices may drop a little more as there are many motivated sellers, short sales and bank foreclosures in American Fork. The bottom is difficult to predict. Large real estate discounts can especially be found on the high end, land, and spec homes as many properties are entering default and are in danger of foreclosure and or short sale. Some of the best bank foreclosures are the HUD homes, Fannie Mae, Freddie Mac. The unapproved short sales can take along time to get approved and are rarely worth the wait in most cases. Would you like to search bank foreclosures and short sales only in American Fork? The links below provide lists of only Short Sales and Bank Foreclosures in the American Fork area.